Teachers render yeoman service to educate the country's future generation. Almost all teachers are dedicated to their profession and monetory gains don't enter the picture. But in most cases, teachers are a forgotten lot after retirement. Not all former students come to their assistance when they are old and feeble. There are only a few associations with the support of former students which bring retired teachers under one umbrella to offer an honourable retirement . In this context, the Royal College Past Teachers' Association (RCPTA) has set a shining example in looking after the welfare measures of past teachers and to keep them happy and healthy after retirement and to maintain a close dialogue with former students. 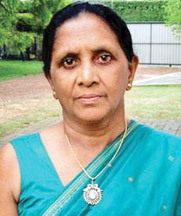 We spoke to the Secretary General of the Royal College Past Teachers' Association, Mrs. Manel Munasinghe, the well-known chemistry teacher who had produced thousands of doctors, engineers and other professionals who hold key positions in the country, as the association celebrates its 20th anniversary. Q: How did the idea of a past teachers' association begin? A: The idea of forming an association was discussed for the first time by six retired teachers when they met at the annual sports meet of Royal College Primary Section in February 1994. They were Ms. Wimala Rajapakse, Ms. C. Liyanagama, Ms. Hema Rajapakse, Ms. Padma Samaraweera, the late Mr. W. Kannangara and Ms. N.V.G Perera. The inaugural meeting was held on the March 31, 1994 at Navarangahala with 20 retired teachers as the "Royal College Retired Teachers' Association". Thereafter the name changed to "Royal College Past Teachers' Association" to accommodate teachers who did not retire from Royal College but got transferred to other schools prior to retirement. It is now a 314 member strong body. It is sad to say that 48 of our members are no more. Q What were the objectives of forming such an association? A: The objective was to promote and foster a spirit of camaraderie among members. In addition looking into the welfare of members and to strengthen cultural, social and friendly relationships between present and past members of the staff and students with the concurrence of the present management of the College. Q How frequently do you meet? A: The executive committee meets after the election at the annual general meeting and events are planned for almost every month of the current year. In February members meet early in the year at the annual medical camp conducted by the Royal College Doctors' Association, and it is like a visit to a small hospital arranged with all the medical specialities under one roof. Royal College provides past teachers with a limited number of complimentary tickets for the Royal Thomian Match in March. In April a foreign tour is arranged where members, their families and friends are allowed to join. In May we remember our departed members at an annual alms giving. In June lately we have arranged Dhamma discussions and multi - religious ceremonies. In July some of our members take the opportunity to meet each other at the annual Bradby Shield rugby encounter. In August we embark on a three-day local tour which is one opportunity where a large number of our members participate. In September, we arrange a one- day tour to give an opportunity to those who are unable to be away from home for several days during the foreign and the three- day local tours. Apart from this the executive committee meets every second Saturday of the month and the last committee meeting is held in October with a dinner hosted by the president, secretary and the treasurer to appreciate the work done by the committee throughout the year for the benefit of members. In November we meet again at the annual general meeting. Q . Was the participation in all these activities up to expectations? A: Well there is a lot of enthusiasm shown by most of our members for most of these activities specially the local three- day tours, to destinations such as Yapahuwa, Galle, Jaffna, Batticaloa, Anuradhapura, Polonnaruwa , Thalaimannar, Somawathi, Madu Church and Nuwara Eliya. We have made arrangements for members to tour India, Thailand, China, Egypt, Malaysia, Myanmar, Vietnam, Indonesia, Dubai and Kenya in recent years. All our members are senior citizens and it is heartening to see how they enjoy themselves during the tours dancing and singing like young ones. The medical camp and religious ceremonies are also well attended. Many generously contribute during the alms giving and actively participate. The medical camp is that most of us wait for every year not only to get treatment but to meet our students who are doctors in all medical fields. There are some members who are ailing and are bedridden and we try to visit them. Q. How do you communicate with such a large membership effectively? A: Communication of urgent news with the membership is effectively done through a network system, where the membership is divided into groups of 10- 15 each, and the three assistant secretaries communicate the news to the group leaders who are all executive committee members and news reaches the members through this network in less than half a day. Urgent news includes the demise or serious illness of an RCPTA member or immediate family and further group leaders constantly communicate with their members to inquire after their welfare. New Year and birthday greetings are sent on the relevant days to all members. Q What kind of assistance other than social gatherings does the association do as a service? A: Financial assistance amounting to Rs. 15,000.00 on the demise of a member and Rs. 10,000.00 on the demise of a spouse is offered as a donation by the RCPTA. Rs.10, 000.00 is offered during major surgery including cataract . A: Fantastic question! Fifteen or twenty years ago we used to buy lot of materials from third parties. Lot of retailers cheated us by selling cheep stuff claiming that those are branded materials. I too as not so experienced and bought and sold cheap stuff for years assuming we were selling number one quality goods. With foreign exposure I realised those were fake.